My sister and I have had this cake every birthday we’ve had! My sister just celebrated her 30th…there was still no other cake to compare…so Colin it was again! come on, this is not just for children or birthday’s… chocolate col’ should be eaten at anytime of the year, month, week, day or hour. every fridge should have one. Colin the Caterpillar Cake celebrates all our family birthdays my son is 31 and daughter 23 . We have a new granddaughter to our fold she too will celebrate with Colin. how much does colin cost? I’ve had a Colin the Caterpillar cake on every one of my birthdays I can remember, too. I just turned 20 and got a bit of stick from my friends when they saw the cake. But when they tasted it… they understood. Rules in my house are: birthday boy/girl gets the face, no exceptions. Tail is also reserved for the birthday boy/girl for tomorrow etc, but this rule is more flexible. Everybody gets a foot with the first piece but after that it’s first come, first served when it comes to the feet. Sazzle & her family have it every Birthday cos she is a nutcase. It is so yummy and chocolatey that every time I have a slice I want to scream ‘I LOVE LIFE’ from a-top a mountain. My cousin Brendan was over from Oz and he said each mouthfull was like a little drop of heaven, even though he is a tool. Will it be your Wedding Cake Oli? You better believe it….He will be dressed in a suit and we will put a Colinette The Caterpillar cake in a dress next to him! Colin is the best cake ever! We have him every birthday and we are 33 and 39! Our daughter is one next week and will be having colin and mini colin’s! So cute! We had him for our wedding anniversary one year too! Just hate to share him with others! My mouth is watering at the thought of Colin now! 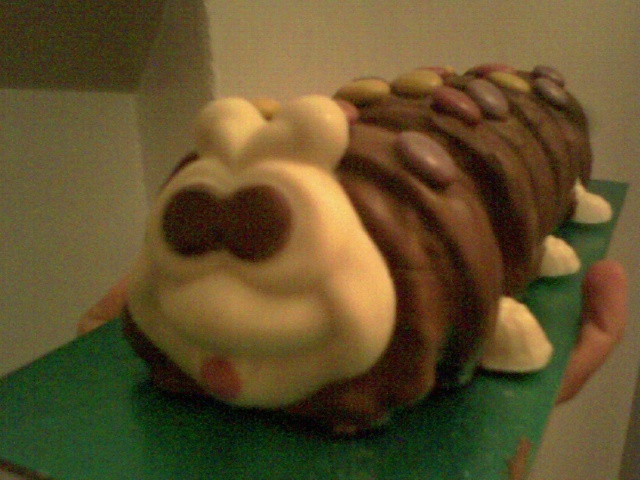 Free range eggs and other good M&S ingredients, no other caterpillar cake is the same, cheap copies of Colin!